Baccano! is just one thrilling and mysterious anime from start to finish. You will feel overwhelmed and confused at what is happening. Somehow, the pieces fall together at the end and it leaves you will a sweet aftertaste. This anime must be watched at every single second of the entire series. I am not stressing that enough. Once you start watching you will understand what I am talking about. For the first few episodes, you will definitely not understand what is going on as the anime seems to be throwing around different stories one after the other. After a while, you will come to realize that the anime is actually telling one complete story from many different points of view. Thus, it may take some time for you to join the various pieces together to form a picture. This is one of those anime that will make you easily confused until the very end. Let's talk about the story. We are given multiple starting points to the many characters throughout the anime right in the first episode, this seems to be a retelling of a story by Carol. She only appears in the first and last episode as just a narrator. So we begin with the many stories of different characters and their points of view of the Flying Pussyfoot incident as well as the after effects. Although the character's individual timelines seems unrelated to one another, but they are all together of a much bigger story that involves alchemy, survival and immortality. This has been one rollercoaster ride to the very end. The art was fantastically illustrated and animated. With a nice brown undertone to bring out the feeling of the 1930s. It was really well presented with cars of the 1930s, street lamps and old buildings. The representation if the characters were really detailed as well. They wore suits and carried handguns. Baccano! had really left a good impression on me through the presentation of the art throughout the anime. The sound was of high quality and the theme songs suited the anime's settings perfectly. With a nice classical opening will pump you up for the episode. The voice acting was perfect with each character having their own unique voices. Sound effects were realistic even for gunshots and explosion sounds. Definitely a good job by the creators. There were so many characters thrown at you at the start of the anime so you will have no clue as who is actually the main character. Let me tell you something. None of them are. All the character splayed a major role throughout the anime since the anime frequently skips and repeat scenes from multiple viewpoints. You will come to be attached to one or two character that you will find memorable- such as Isaac and Miria are just hilarious. This is one serious anime and most characters are either insane killers or scary immortals. In the end, I came to enjoy this anime gradually. This is because I was completely lost in the beginning and had no idea at what was going on. It turns out this anime was really about an investigation of a murder plot, political corruption and gang wars. 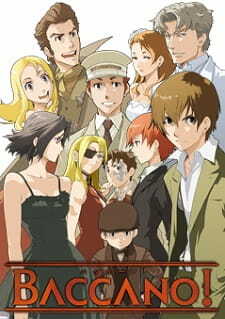 If you are really interesting in action, adventure, mystery, and gore, then this is definitely an anime you must watch. Confusing at first, makes sense in the end. Multiple story lines are shown so be prepared be be lost. Amazingly illustrated and highly detailed from the environment to the characters. Loved the theme songs ans the voice acting was excellent. Plenty of characters that have their own stories to tell. Enjoyable to the every end. Thrilling and fantastically retold. Action and adventure. It's all there.